If you were just settling in for a night of Xbox One gaming, you may be pleased to see a pretty handy update waiting for you. Microsoft's Major Nelson revealed the console's April update is heading out now, though some might not see improvements for a few days yet. 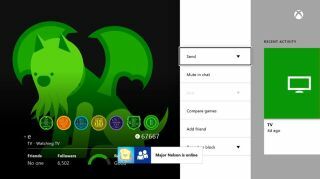 The Xbox One April update is most notable for bringing better friend features, namely notifications when favorites or friends sign in to Xbox Live. According to MJ, this was "one of the most frequently requested features, so we made it a priority to include it in this update." Also in the friends category is the ability to have friends who are in multiplayer identified in the friends list. The April update doesn't stop with your amigos. It also includes improvements to game and app saves and updates, improved GameDVR video quality and Blu-ray player support of 50 Hz video output for content recorded at that frequency. Over the coming days, Microsoft will update the Blu-ray Player app as well. Firmware updates for the Xbox One controller and headset adapter are also making their way down helping to reduce static and improve wireless connections. Kinect voice and motion commands have been tweaked for better quality and reliability, so there should be fewer instances of non-hand objects sparking unwanted actions. Finally, Microsoft has implemented silent reboot following system updates, and on-demand system updates are now available. This means that for users leaving their Xbox One in Instant On mode, updates will happen automatically and go back to standby when it's done downloading, so you won't have to turn on your console after an update from now on. How does the PS4 stack up to the Xbox One?